It's Track Time! 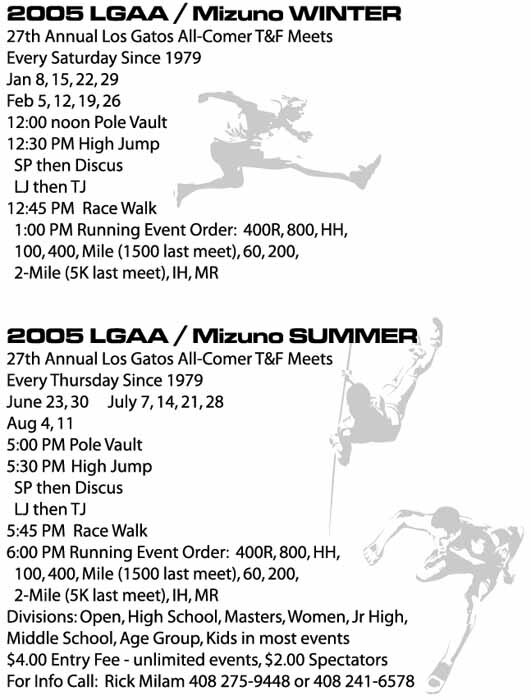 : Starting On Jan 1st, LynbrookSports.Com will link you to the 2005 Track Page - Happy New Year! CalTrack All-NorCal XC: Teams are here. Coaches/athletes: Please check the spelling of your name and address that the certificate should be mailed to and email me, Hank Lawson, with that info. Lady Vikes BasketBall: Nice article on the Lynbrook Ladies BasketBall team coached by Darrin Garcia (Lynbrook '04 Track Coach). SJ Mercury News All-CCS: Teams have been selected and posted with some great coverage by the Mercury News. Los Gatos All Comers: Meets start on Jan 8th (12:00 field, 1:00 track) and go for 8 weekends. 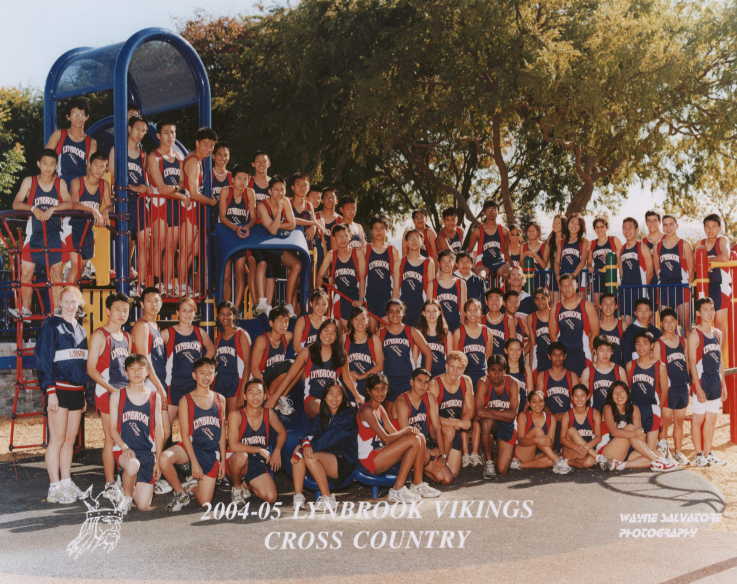 LHS Alums...: There will be an XC lunch on Dec 23rd at 12:30 at Le Boulanger at El Paseo - get your run in and then we'll see you there. All CCS & All NorCal: The Coaches Alliance CIF-CCS All Cross Country Team will be posted by Dec 20th and then the CalTrack.Com All NorCal Cross Country Team should be posted a week later. CCS Post Season Minutes: These are UNNOFFICIAL minutes from Walt VanZant of Wilcox HS. New FireFox Browser! : Tired of Popups, Spyware, Ad-Ware and the threat of hackers taking control of your system? There's a great new Browser out there called FireFox which addresses all of these issues, and it's FREE - I've been using it and I LOVE it! Jack Welch Story: A story on the condition of the Welch Family & Jack. Walt & Tom: SCVAL Coaches: If you have any agenda items for our Post-Season meeting please email them to Tom & Walt (link on the left) by Sunday night. The meeting is Mon (11/29) at 4:00 at Wilcox HS. Minutes of the meeting can be found by Clicking Here. CBED Proposal (Revised): Ernie Lee (Gunn) of SCVAL has a proposal that he will be submitting to SCVAL and then to CCS. League Reps (SCVAL & non-SCVAL), take a look at it and see what you think - if you have any comments, please get them to Ernie Lee before Nov 29th. Old School Mile: Click on the link to the LEFT for the results to the Marshall Clark Old School Mile (which was really a 1600). Matthew Petrillo (4:38.55) and Alicia Follmar (5:01.84) had the fastest times of the day. SJ Mercury: Nice article on Mitty Girls XC Team. SJ Mercury: Not bad - XC gets 3 out of the 4 Athletes Of the Week. Saratoga News: Covers Follmar & Iyer of Saratoga along with Lynbrook, Prospect & Westmont. CCS Finals: MayC, Cindy & Luis all run Personnal Bests at Toro Park. MayC qualifies on to States. Miller Jr Hi: When this years Seniors were 8th graders in Jr High school. Saratoga News: Follmar (Saratoga) & Palm (Prospect) grab the headlines this week. Athlete Of the Week: Kevin Schneider (Fremont) gets the nod after becoming the first 'Firebird' (they were 'Indians' prior to 1994) to win an XC League Crown. George Carlin's: View On Aging. A good chuckle and a good message. 1600m Time Trial: Lynbrook ran their annual time trial while getting to watch Saratoga work hard, results are: Jensen (4:49.2), Huang (5:42.3), Ju (6:09.9), Stahlberg (6:22.7) - coached watched although he talked a good time. CCS Entries file: Coaches: As a reminder, the League Rep MUST send in the CCS Excel Entries file to Mark McConnell and CCS by Monday (11/08) noon. DAL Finals: A warm and clear day at Crystal Springs. Lynbrook comes away with a 6th in VB, 5th in VG, and 3rds in F/S, JVB & JVG. Jensen, Huang & Ju all qualify for CCS. Lynbrook Invite: Everyone improves by :30 seconds up to 2:00 on the same course that was run at the beginning of the season. A great tune-up for League. HMB wins MSAC: The surprise of the day when the HMB Girls walk (run) away with the second fastest time of the day. Crystal Springs #2: JV Girls win, Varsity Boys run :20 over CCS qualifying time, girls run :01 over qualifying time and Shruti Waghray PR's by 2 min with a 22:21 mark. Alvin Harrison: Accepts 4 year ban for using steroids - who's next? Crystal Springs Cross Country Course is in its 32nd year. We are hoping for many more. The use of this facility involves many areas of responsibility. The course is located on land owned by the San Francisco Public Utilities Commission. It is also a State Game Refuge. It is also located adjacent to a very sensitive residential area. The permit to use this area as a cross country course has been granted to the College of San Mateo. The fall weather in this area can become quite hot. This situation has to be taken very seriously for the safety of the runners. I have taken some spot checks of teams and found some teams were not carrying emergency cards for their athletes. This will not be tolerated. You will not be allowed to run at Crystal Springs if the coach does not have an emergency card for each athlete in his/her possession. There is a form that the race director must have the coach from each participating school sign before participating. 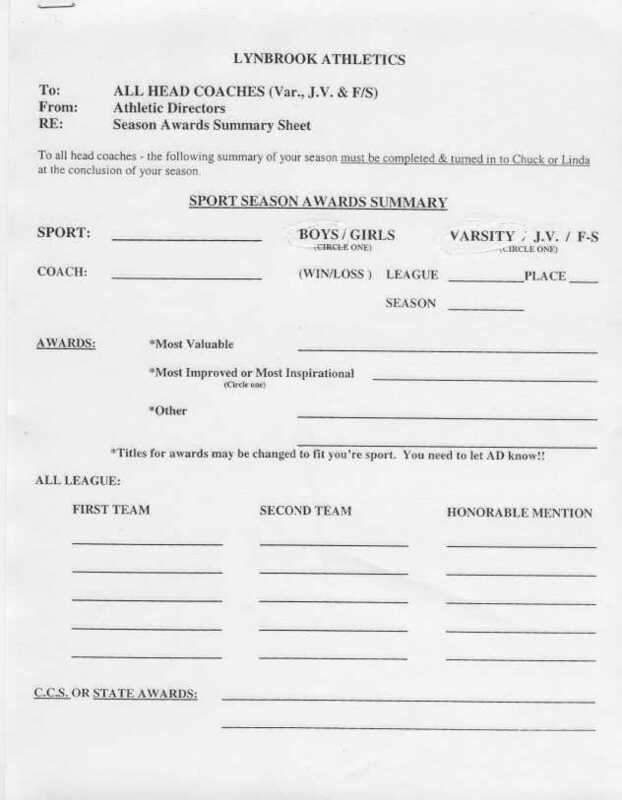 This form is located in the handbook. I will be checking to see that this form is completed before competition starts. If this form is not filled out, I will stop all races until it is completed. It is the responsibility of the race director to read this handbook in detail. It is also your responsibility to convey these rules and regulations to all participating coaches. This handbook will also be posted on norcalstat.com and Hank Lawson--will you please post it on your website? I know that this requires an extra effort on the part of race directors, commissioners(or the designees). Ignorance if these rules will not be an excuse. The safety of the athletes comes first. Please call me if you have any questions. Monterey Bay Invite: Soph/Frosh Girls squeak out a 4 point win over St Francis. Varsity Boys are closing in on the auto-qualifier time for CCS, Varsity Girls continue to improve as the whole team is building confidence in their racing. Rallye Run: Girls come thru big time with a 3 point win in the Annual Rally Run. Team of Cindy, Aditi, Lauren, Metha, Nishi, Helena & Missy got those sought after 'Retro' T-shirts. Livestrong Bands...DQ: Don't take the chance - consider them jewlery. Santa Teresa article: Nice coverage for Santa Teresa XC and coach Mike Dudley - XC is not just about running, it's a lifestyle. Saratoga News: Saratoga & Lynbrook get coverage. Athletes Of the Week: SJ Mercury may not be publishing the XC rankings but they are acknowledging some XC runners - this week it's Ben Sitler (St Francis) and Jessica Buffum (Lynbrook) for girls Volleyball. Saratoga News: Some more good coverage from our local newspaper for both Saratoga & Lynbrook HS. SCVAL Center Meet: Pack running was the order for the day - once you hit 2 miles, take off. Lots of folks seeing Crystal for the first time. Paul Lee and Shirley Liu earn sweats. Crystal Springs 2nd Generation: Parents: This is for you! Did you run Crystal back in HS and now your Son or Daughter is running XC? If so, send me your info so I can add you to the list. E-mail Hank Lawson your time, year and meet. Artichoke Invite: Wow, nothing beats the Scare Zone after you're wiped out from racing. Huang and Jensen lead the squads with Shruti Waghray having the race of her life. Toro Center Meet #2: Another chance to run on the Toro course where CCS is going to be held. Sign up now. Palo Alto Weekly: Nice article on Tori Tyler (Gunn) describing her Stanford Invite day. Serra's Tom Brady: Ever want to own a brand new car that was awarded to the SuperBowl's MVP? Now you have a chance for a mere $25 - click on the story link or goto www.tombradycar.com to see how. Alicia Follmar: is the Saratoga News headline story for the week. She is also Athlete Of the Week for the Mercury. Central Park Invite: Jason Wang starts the day off right by winning the F/S Boys race. Luis Jensen snags a 7th in the Varsity Boys. MayC Huang bounces back from Stanford with a 4th place finish and Cindy Ju grabs hardware with 14th place. Crystal Springs Center Meets: Coaches: If you plan on going to one of the three Center Meets at Crystal in October, read the instructions on how to enter. They are doing it different this year by using Direct Athletics, an on-line registration site - click on the link for more info. Stanford Invite: A real eye opener for those that have never experienced a Big Time XC meet, run on grass, over a 5K distance. Jason Wang and MayC Huang lead the Vikes. Hash Run: The annual "Hash Run" has Brandon Lee the first to find "The Fox" (in 30 minutes). If done correctly, it was a 3 mile run - it took some an 1:20 to complete, whoa. Root Beer for all at the finish. Course Conversions: Hey SCVAL (and other) girl runners, check out the new course conversion file thanks to Anthony Chew (Cupertino dad). I will repost as Mr Chew continues to send me new sheets. Saratoga Invite: Lots of close races. VB take 2nd over Tino by 1, JVB nip Los Gatos by 1 for 1st, VG loose out 4th to Toga by 3, JVG bettered by Gatos by 2 for 2nd. Firebird Invite: Luis Jensen leads the way with a 9th place finish in the VB race while Shamil Hargovan takes second in the JV Boys race. MayC Huang leads the way for the Vikes with her 3rd place finish. Jason Wang grabs 4th in the F/S race and Cindy Ju gets 14th in the JV Girls race. CCS/CIF School Abbrv's: The folks at the CIF office have established NEW school Abbreviations that will be used at this year's State XC & Track Meets. At a Section level, we will be using the same list. Please review the list so you are familiar with your schools code - it may have changed from the past. These codes will also be used at the Crystal Springs Center Meets so you will need to know them. Lynbrook Center Meet: A Hot One! Had to be over 90. But the athletes come thru running some great times. MayC Huang led the Lady Vikes with a 5th place finish, while Jason Wang was top dog for the Varsity Boys finishing 15th. CCS XC Meeting: The pre-season CCS XC meeting is scheduled for Sept 1st at 7:00 pm at the CCS office - feel free to attend. Crystal Springs Schedule: Coaches/Meet Directors - New information on the Crystal Springs schedule, Newsletter and invoicing - please check it out. 300 Mile Club: Jonathan Tsai is the only member this past summer of the "300 Mile Club". SCVAL Pre-Season: XC Meeting is on Sept 7th @ 5:00 at Wilcox HS. Get Walt VanZant any agenda items you want to discuss. LG All Comer: Weekly RESULTS from the Thur All Comer meets, starting June 24th. Results thru Aug 12th. The DVC All-Comers kick off on July 2nd thru Aug 6th. Update #2: Pre-Season training starts Aug 16th at 9:00 at the new Gym. Lynbrook Golf Tournament: Due to lack of signups, the golf tournament has been CANCELLED. SJ Mercury: "Training Tables" - Local Olympians and what they eat. Olympic Trials: screensaver (205 Mb). Pretty cool pics. SJ Mercury: Overcoming adversity through the use of athletics. Pre-Season Comparisons: A pre-season look at who's returning and how everyone compares. Lynbrook XC : We start on June 24th at 5:30pm and will run every Tu/Th throughout the summer meeting at Lynbrook Pool (although the Tue will start in July). Anyone is welcome to come run with us. Still Track time! : So why are you checking out the XC page? Nothing of any major news will be posted until a week after the State Track Meet. XC Starts : On Aug 16th (Mon @ 9:00 AM) at the Field House (new Gym).